Rouge Pictures has released its newest thriller, “The Strangers”, starring Liv Tyler and Scott Speedman. Last year GTT’s DP Tom Wells was contracted by New Wave Entertainment to shoot the EPK for the movie, keeping him on location for 17 days with the CineAlta Sony F900. The footage was shot for promotional use before the film’s release as well as bonus features that will ultimately be included on the DVD. 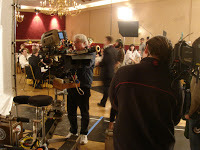 While on set the crew focused on special effects, makeup, and interviews with all the cast and lead crew members. The movie is getting great reviews from critics, and several of GTT’s members who have seen the film agree – it’s freaking scary!